Few repairs, now time to get cranking! We were delayed in getting the second plastic side up on the big high tunnel, so a day of prolonged 20 mph wind Wednesday yanked the man/tractor doors off. The wind was relentless on the hill for about 12 hours. The sound of the gusts beating on the plastic really put your nerves on edge. The wind also whipped the plastic off Caterpillar No. 2, and partially undid Caterpillar No. 1. While the day was a bummer, it’s nothing that can’t be fixed/redone. Like anything else, when you have a chance to do something all over again, you usually come up with ways to do it better. Here’s one of the crank-down sides. Metal poles are screwed together, and shoved through a pocket in the plastic. Pulleys are fastened down the length of the side, and there’s a winch in the tunnel. I untangled the Caterpillar No. 2 mess with little trouble, and finished shoveling the raised beds in the big high tunnel. When I tapped out to take care of the little sick patient, Angelica stepped in to spread mushroom compost on all of the big high tunnel rows. We have eight raised beds in the big high tunnel. We shoveled these by hand because the walking tractor wouldn’t have been able to squeeze that many rows in this space. That’s mushroom compost spread on the rows. 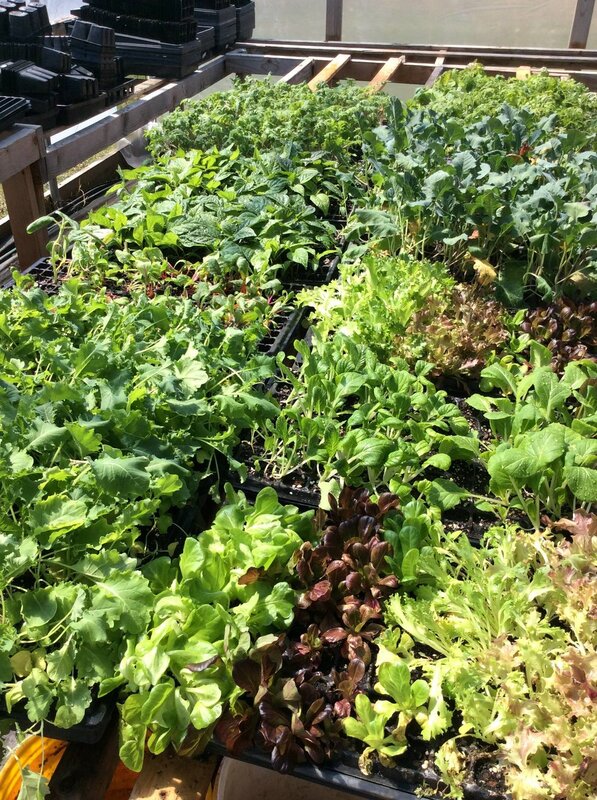 Kale, Swiss chard, peppers, tomatoes, lettuce, and other greens are ready to go in the high tunnels ASAP. These trays were started in our basement, under grow lights. They spend a few days in the propagation tunnel to “harden off” before being planted. That’s what’s shown here.